Arturo OFarrill has been visiting Cuba since 2002, and although he has not been the only US musician to perform in Cuba in recent years, he is without question, the one who has made the deepest impact there - enough so that when US reporters were gushing during a press conference about the historic nature of the Minnesota Orchestra's concerts in Cuba in May 2015, the Cuban hosts reminded them that Arturo had already been performing there for a while. Cuba: The Conversation Continues is well-named. Both physically and musically, this 2-CD recording picks up where the generation of Arturo O'Farrill's father, Chico O'Farrill, Dizzy Gillespie, Machito and others left off. 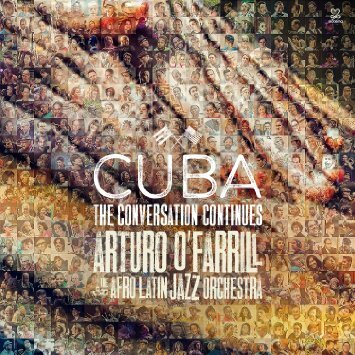 It was recorded in Abdala Studios in December 2014 using a combination of musicians from O'Farrill's Afro Latin Jazz Orchestra and some of Cuba's finest Jazz musicians. The first work in the first disc, The Triumphant Journey, evokes the sound of the Gillespie-Pozo--Machito-Chico O'Farrill era. The second, The Afro Latin Jazz Suite, continues in a similar vein but also incorporates musical elements from other parts of Latin America. You can hear some quotes of and references to these giants in both of these. A key difference is that Rudresh Mahanthappa contributes some intense post-Bop saxophone passages in the suite, which contains wonderful emotional and dynamic contrasts that rise to the level of Chico's best work. This has become one of my favorite compositions to date of Arturo O"Farrill. Guajira Simple is a pleasantly deceptive name - it is actually a complex composition by Cuban Jazz artist Alexis Bosch. Alabanza is a richly-textured composition by Michelle Rosewoman, and Blues Guagauncó features Bobby Carcasses, whose role in the flowering of the modern Jazz scene in Cuba has been incalculable. In the second disc, Vaca Frita mixes elements of Cuban Jazz with Jazz-Rock and adds DJ Logic with some scratching. Just One Moment is a contribution from one of Cuba's most interesting young saxophonist/composers, Michel Herrera. It is phrased in 3/3/2. El Bombón is a big band arrangement of a nice changűi. Second Line Soca uses a New Orleans brass band motif to launch a journey through multiple styles of Jazz and relates them to the music of the Caribbean. The final song, There's a Statue of Jose Marti in Central Park, is a complex mini-suite that ends in a fiery conga/comparsa. I have attempted to describe this recording, but the paradox with the very best recordings of Cuban Jazz is that words really can't do them proper justice, and Cuba: The Conversation Continues is in that category. Ordinarily, I would say that it is too soon to refer to a recording as historic, but this recording truly is, both for the scope of the music that it uses and the circumstances of its production. When you listen to this, you'll hear a lot of things that I neglected to mention, and you will return to many of the compositions to notice new things. But that is where the joy is, is it not? As these lines are being written, Cuba: The Conversation Continues is a nominee for a GRAMMY in the categories of Best Large Jazz Ensemble and Best Instrumental Composition. It will not be a surprise if this page needs to be updated later to include some awards.